Aromatherapy is the alternative way for natural healing, using a choice of five special pure Essential oil blends. This soothing and gentle massage improves energy, promotes relaxation and brings about a sense of well-being. Aromatherapy massage unleashes the healing power of essential oils. Once inhaled, molecules of essential oils send messages to the limbic system of the brain, which affect heart rate, stress level, blood pressure, breathing, memory, digestion and the immune system. Essential oils are also absorbed through the skin. Each essential oil has particular healing properties. The Lilawadee is one of the Spa's original signature massages. This invigorating treatment begins with a deep back massage to stimulate tired and sore muscles, reduce tension and improve blood circulation. This treatment firms the body, increases blood circulation and soothes tense muscles. Traditional oriental massage therapy is done with pure herbal oil. One can choose between Bergamot oil, which uplifts and calms the spirit, helps in achieving sound sleep, and aids in digestion, and Lemongrass oil, which soothes muscular aches and pains, heals fungal skin infections and settles upset stomachs. Traditional Thai massage is the most effective and comprehensive system to energize and strengthen the body. Pressure - point massage is applied on the body using stretching techniques to relieve muscle tension. 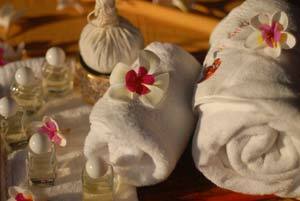 This traditional oriental massage therapy is also known as Yoga massage. The therapist uses her hands, knees, legs and feet to move one into a series of Yoga-like stretches. The Revitalizer is both relaxing and energizing, aids in reducing stress, improving circulation, increasing flexibility, improving range of motion and centering the mind and body. This holistic healing technique assists in rebalancing the body, linking the relax zones on the feet to organs and systems in the body. The therapist uses thumbs, fingers and palms to relieve tension. The feet are regarded as the "second heart of the body", as particular pressure points in the foot correspond to specific organs of the body. Once pressure is applied, a signal is sent to the central nervous system where it is processed in the brain. It is then relayed to the particular internal organ, which makes the necessary adjustments in fuel and oxygen, thereby helping to adjust the body's over-all tone level and lowering tension level. This leads to less wear and tearon the body's systems.